A French word for a type of bread starter. The mixture consists of a portion of yeast, which is allowed to activate in warm water for several minutes. The activated yeast is mixed with additional water and then flour is stirred into the mixture creating the consistency of thick batter. The poolish is left to ferment for several hours. 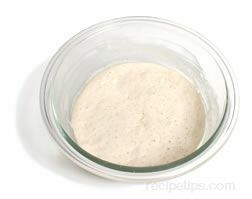 After fermenting, the poolish starter is mixed with the remainder of the bread ingredients to create the dough. The resulting bread has a light, airy, springy texture and nutty aroma. Many of these qualities mimic those of breads prepared with the more time consuming sourdough starter method.